Today marks the 113th anniversary of the start of the Boxer Rebellion in China. Read on! 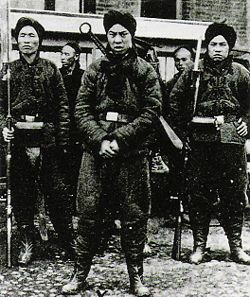 In response to widespread foreign encroachment upon China's national affairs, Chinese nationalists launch the so-called Boxer Rebellion in Peking. Calling themselves I Ho Ch'uan, or "the Righteous and Harmonious Fists," the nationalists occupied Peking, killed several Westerners, including German ambassador Baron von Ketteler, and besieged the foreign legations in the diplomatic quarter of the city. By the end of the 19th century, the Western powers and Japan had forced China's ruling Qing dynasty to accept wide foreign control over the country's economic affairs. In the Opium Wars, popular rebellions, and the Sino-Japanese War, China had fought to resist the foreigners, but it lacked a modernized military and suffered millions of casualties. In 1898, Tzu'u Hzi, the dowager empress and an anti-imperialist, began supporting the I Ho Ch'uan, who were known as the "Boxers" by the British because of their martial arts fighting style. The Boxers soon grew powerful, and in late 1899 regular attacks on foreigners and Chinese Christians began. On June 20, 1900, the Boxers, now more than 100,000 strong and led by the court of Tzu'u Hzi, besieged the foreigners in Peking's diplomatic quarter, burned Christian churches in the city, and destroyed the Peking-Tientsin railway line. As the Western powers and Japan organized a multinational force to crush the rebellion, the siege of the Peking legations stretched into weeks, and the diplomats, their families, and guards suffered through hunger and degrading conditions as they fought to keep the Boxers at bay. On August 14, the international force, featuring British, Russian, American, Japanese, French, and German troops, relieved Peking after fighting its way through much of northern China. Due to mutual jealousies between the powers, it was agreed that China would not be partitioned further, and in September 1901, the Peking Protocol was signed, formally ending the Boxer Rebellion. By the terms of agreement, the foreign nations received extremely favorable commercial treaties with China, foreign troops were permanently stationed in Peking, and China was forced to pay $333 million dollars as penalty for its rebellion. China was effectively a subject nation. NOTE: My thanks to Xue Sheng of MartialTalk forum for the reminder. Copied from History.com.